Each year since 1999, pilgrims have come to the Hermitage of the Holy Cross on the weekend immediately following the feast of the Exaltation of the Holy Cross. This year was no exception, as over one-hundred pious Orthodox Christians journeyed to Wayne, West Virginia to join in prayer with the monks of the Hermitage. The Brotherhood was blessed to have His Grace Bishop Gabriel of Manhattan as their guest of honor. The divine services began on Saturday afternoon with a moleben to St. Panteleimon, the heavenly patron of the Brotherhood. Pilgrims submitted lists of the names of their ailing loved ones to be commemorated at the moleben, which was sung in the open air in the courtyard of the Monastery’s outdoor chapel. Fr. Onouphry Keith of St. Nicholas ROC in Ashville, NC, served the moleben together with Hieromonk Alexander and Hierodeacon Andrew of the Hermitage of the Holy Cross. After the moleben, a meal was served for the pilgrims. 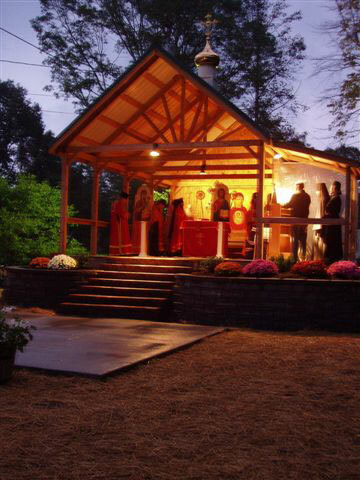 Then, following a short break, the Saturday night vigil, served by His Grace Bishop Gabriel, began in the Monastery’s outdoor chapel. There were a few moments of rain during the Vigil, but a large tent kept the worshipers, candles, and holy icons dry. By the end of vigil, the weather had cleared up. Vladyka Gabriel, the monks, and the pilgrims solemnly venerated the Precious Cross in the cool night air. The next morning, all assembled for the hierarchal divine liturgy. This was the first time that a bishop had served divine liturgy at Holy Cross Monastery since the Brotherhood’s move to West Virginia in 2000. The occasion could not have been more beautiful. The previous evening’s rain had completely disappeared, and all proceeded smoothly and gracefully. Six priests and three deacons concelebrated with Bishop Gabriel. Students of Holy Trinity Seminary served as subdeacons and altar servers. Hegumen George of Holy Trinity Monastery (the Brotherhood’s spiritual father) served as first priest. Seeing the hierarchal liturgy proceed so beautifully, one could not help but marvel at how the Orthodox Faith in all its beauty has truly, in our days, been spread to the furthest corners of the earth. Who could have thought that the same God-inspired service of prayer that was offered in Byzantium and Holy Russia would have found its way into this remote hollow in the West Virginia hills? Who would have thought that, in such a place, an Orthodox monastery would be established, or that right-believing pilgrims would come to such a place to pray? After the service, the worshipers drove to a nearby state park for a banquet prepared by the family of Hieromonk Seraphim, the Brotherhood’s superior. After the meal, Vladyka Gabriel spoke of the important role that monasteries play in the life of the Church. He recalled how in Old Russia, the pious faithful visited monasteries in order to rest, pray, and be spiritually revived before returning to their struggles in the world. Vladyka invited the pilgrims to continue this tradition by visiting the Hermitage of the Holy Cross, where American converts to Holy Orthodoxy can hear the divine services offered in their own native tongue. He asked that those present tell their friends and loved ones about the monastery so that they too might visit and pray. Lastly, he spoke of the need for the laity to support the Hermitage financially, as also by encouragement and prayers.